With only the strained sinew of pop culture binding its skeletal structure into any recognizable form, This is 40 fits nicely within a holiday season full vapid gatherings populated by mildly familiar acquaintances you’d really rather not have to hang around. It’s the maladjusted product of a director and his actress wife who would continue to cast their blood moppets and then ask both they and the actors around them to hurl profane invectives for well over two hours. And it’s a comedy whose notion of timely gags involve Viagra, the final season of Lost, and a reunion of Graham Parker and The Rumor, which coincides not-so-coincidentally with the release of their new “comeback” album. The main selling point for This is 40 is that it follows the continuing domestic disquietude of the more irksome couple from writer-director Judd Apatow’s Knocked Up. When last we saw them, Pete (Paul Rudd, still playing Paul Rudd) was tripping on shrooms and Debbie (Leslie Mann) was getting dressed down by Seth Rogen in a hospital waiting room. Five years later, Pete and Debbie are still a quarreling, neurotic mess, aggravated by the sort of dire money troubles that allow folks to buy big a house, start a record company, run a side business, own an original doodle drawn by John Lennon and funnel over $10,000 to your father. What’s most maddening is that This is 40 is more a series of scenes than a cohesive whole. Set during the week when both Pete and Debbie turn 40, Apatow jumps from one vignette to another, whether it’s far-less-funny reprise of Debbie going clubbing or Pete combatting a hemorrhoid. For intrigue, decide which is more offensive: Debbie threatening to physically harm a youngster who dared issue some benign insult about her daughter on Facebook, or deeming that the employee embezzling money from Debbie’s clothing boutique isn’t the hip, voluptuous Megan Fox but rather the Asian girl who looks and talks funny. The inclusion of Albert Brooks and John Lithgow as Pete and Debbie’s dads, respectively, at least breaks up the stagnation. 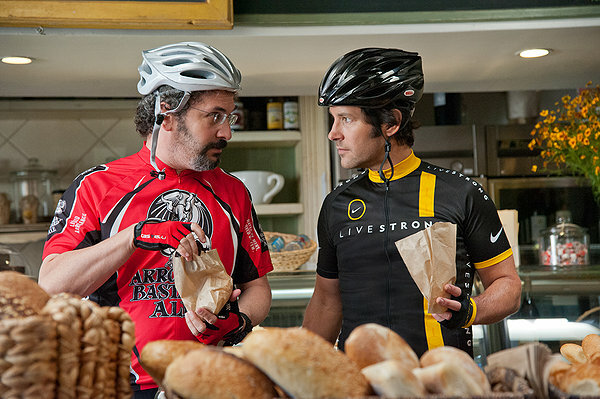 Still, Apatow makes Larry (Brooks) a mooch lacking social graces or much in the way of dignity. And while Debbie wants to mend fences with Oliver (Lithgow), her estranged biological father, five minutes in her presence gives you some idea why daddy might have stayed away all those years. Ultimately, nothing of substance really happens in This is 40, which is overlong by at least the same number of minutes. There’s little empathy for a couple already intolerable in short spurts five years ago. If there’s more than a modicum here that rings true about your own life, seek immediate marriage counseling.